Cover Story: Vidhan Sabha Chunav: Aalekh Agla Morcha Unnis Ka The wins in the three heartland states have re-energised Rahul’s Congress, but can the party stitch together a strategy to challenge Modi in 2019? Congress Rahul Ranneeti The inside story of how Rahul Gandhi’s Congress pulled off three stunning victories in the Hindi heartland. BJP Sir Par Mandarati Chunautiyan What the BJP needs to learn from the 3-0 loss to get back on track for Lok Sabha 2019. Madhya Pradesh: Nath Ke Haath Mein Baagdore The Congress did well to tamp down the rival ambitions of its leaders and ran a hard-fought campaign. Now just to bring the same tenacity to governance. Rajasthan: Pilot Ne Lagayee Naiya Paar After the euphoria of celebrations will follow the harsh reality of finding a leader who can deliver on poll promises when the Raje regime has left state coffers empty. Chhattisgarh: Badlav Ki Lahar A concerted push and anti-incumbency get the Congress a victory beyond expectations. But now it has some tall poll promises to keep. Telangana: Mehnat Aur Saugaat KA Meetha Phal KCR’s ‘sop saturation’ strategy wins the TRS a landslide and a second term. Mizoram: Phir Baaghi Ko Command Mizoram has a history of voting out governments after two terms. Seeking a third term , the Congress was, in a way, staring at defeat. 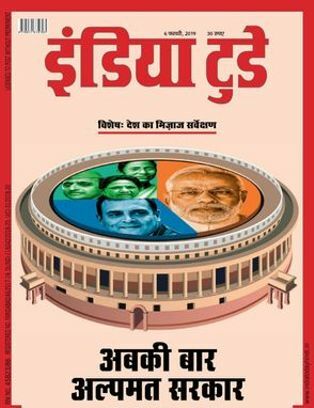 India Today Weekly Magazine 06, फरवरी 2019 मुद्दा इंडिया टुडे पत्रिका: Desh Ka Mizaj Muqabla Hua Qareebi Four months away from the general election, our survey shows the NDA in a vulnerable position for the first time. 2019 is far from being in the bag BJP: Ab Udhne Lage Andeshe The BJP seems down after recent defeats. Will this be an opportunity for party president Amit Shah to formulate fresh strategy or is he part of the problem? Sarvshreshth Mukhyamantri: Didi Number One Playing unifier at the recent opposition rally, the feisty Mamata Banerjee wins the top slot fourth time in a row Congress: Jeet Ka Haath? Buoyed by electoral successes in the past year, a recharged Rahul Gandhi continues his ascent as Prime Minister Narendra Modi’s prime challenger Arthvyavsatha: Patri Se Utri Arthvyavastha The jobs crisis, bank loans mess and farm distress have combined to drag down the economy. The Modi government’s image reflects its faltering performance Videsh Neeti: Rafale Ki Gaanth Public opinion is divided on the Rafale deal, but it’s the allegations of crony capitalism that should worry the Modi government. Its handling of Pakistan, though, still draws approval Mahagathbandhan: Sajhedari Ki Siyasi Taqat With the MOTN predicting 58 seats for the SP-BSP-RLD pre-poll alliance in UP in 2019, it seems to be advantage mahagathbandhan across the country Samajik Mudde: Aaye Nahi Achchhe Din PM Modi’s achhe din remain a far cry for most Indians even as persisting caste and religious inequalities brew discontent Cinema: Salman, Bhai God! The newly married actors scored high on the popularity index, giving the Khans of Bollywood some tough competition Khel: Pitch Ke Pehalwan Sportswomen from tennis and badminton made it to the top five in the list of India’s best sportspersons, but the country still bleeds blue. 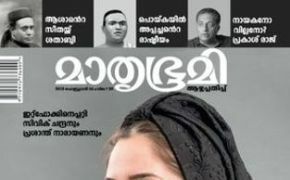 India Today is an Indian weekly news magazine published by Living Media India Limited, in publication since 1975 based in New Delhi. India Today is also the name of its sister-publication in Hindi. Aroon Purie has been the magazine’s editor-in-chief since 1975, a position he has held continuously for the last three decades. It is part of the India Today group, also founded in 1975, which now includes 13 magazines, 3 radio stations, 4 TV channels, 1 newspaper, a classical music label (Music Today), book publishing, and India’s only book club. With the publication of its 30th Anniversary issue in December 2005, the magazine, which had commenced publication in 1975 with a circulation of 5,000 copies, has published five editions and currently has a circulation of over 1.1 million copies with a readership of over 5.62 million. इंडिया टुडे Weekly Magazine subscriptions will commence either from current issue or from next coming issue. The Weekly Hindi Magazine will be shipped immediately on getting the issues from the publisher. They are inclusive of Diwali and Annual issues. Any special issues will also be sent free.